Use SPF 15 (SPF 30 if using AHA/BHA or retinol) every day, rain or snow. UV rays from the sun are the #1 cause of skin aging & skin cancer & don't take any days off. After SPF, these ingredients can make a real difference: alpha or beta hydroxy acids (AHA/BHA), vitamin C, retinol & peptides. Packaging is critical for vitamin C & retinol, which degrade quickly in light and air. Get only products in opaque containers, preferably pumps or tubes. You may see a difference after a few applications, but usually you'll see improvement over a few weeks. Your anti-aging friends are SPF, AHA/BHA, vitamin C, retinol & peptides. Here's what to look for and our product picks, all Leaping Bunny-certified cruelty free! A moisturizer with SPF is a great dual-purpose product. By having the SPF as part of your moisturizer, you'll be more likely to use it every day, which is what you need to do. Use SPF every day, rain or shine, winter or summer. Cold and clouds don't stop UV rays. If you see daylight, UV rays are there. Foundation with SPF? Don't rely on it for your sole sunscreen. If you use the quantity needed to get the SPF protection, you'll be wearing way too much foundation. Use an adequate SPF product beneath your foundation, even if your foundation says it's SPF 30. At least SPF 15. If you use an AHA/BHA or retinol product, get SPF 30. Zinc oxide, titanium dioxide, or avobenzone as one of the active SPF ingredients, to make sure you are protected against the full UV spectrum. Zinc oxide is often recommended by dermatologists because it covers the full spectrum by itself and can also benefit skin as an anti-irritant. Glycerin or hyaluronic acid (aka sodium hyaluronate), to reduce the appearance of fine lines. These are natural components of your skin, residing in the space between skin cells. They both bind water within the skin, and that's what gives our face its fullness. As we age, our skin's own components aren't as efficient at binding water, so our face loses that fullness. By using a moisturizer with glycerin or hyaluronic acid, you boost your skin's natural ability to bind water, and it temporarily plumps your face, making lines less visible. 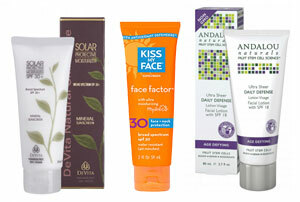 Kiss My Face Face Factor SPF 30 (not the SPF 50 version), MSRP: $12.95/2 oz, but at Vitacost for $8.08. Includes glycerin, hyaluronic acid, and antioxidants. Fragrance free and vegan. Good for sensitive skin. DeVita Solar Protective Moisturizer SPF 30, MSRP: $25.95/2.5 oz, but at Vitacost for $14.19. Includes glycerin and hyaluronic acid. Fragrance free and vegan. Excellent for sensitive skin. Andalou Daily Defense Lotion SPF 18, MSRP: $14.95/2.7 oz, but at Vitacost for $11.99. Includes glycerin, hyaluronic acid, and antioxidants. Vegan. Alpha hydroxy acids (AHAs) and beta hydroxy acid (BHA) exfoliate dead skin cells that build up on your skin's surface, revealing healthier new skin. AHAs include glycolic, lactic, and malic acids. BHA is salicylic acid, which is related to aspirin (avoid BHA if you are allergic to aspirin). AHAs and BHA are equally effective. The main difference is that AHAs work on the surface of skin, while BHA works on the surface and within pores. If you have blackheads or enlarged pores, BHA can be better because it can help unclog pores. Important: When using an AHA/BHA product, daily use of sunscreen or an SPF moisturizer is critical (get SPF 30). If you don't, you are exposing new, vulnerable skin to UV rays, and you can cause more harm than good. For AHA, look for a product with 8%-10% AHAs. For BHA, look for 1%-2%. These percentages are suitable for daily use. If you need a major reset, higher percentages are available, but be sure to follow the label and don't use more often than specified on the label. DeVita High-Performance Glycolic Acid (12% AHAs), MSRP $32.95/1.7 oz, but $22.59 at Vitacost. Some people may not be able to tolerate the higher percentage AHA in this one. Fragrance free and vegan. Paula's Choice 8% AHA Gel Exfoliant, MSRP $29/3.3 oz. Fragrance free and vegan. Paula's Choice 2% BHA Liquid Exfoliant, MSRP $29/4 oz. Fragrance free and vegan. Paula's Choice 2% BHA Lotion Exfoliant, MSRP $29/3.3 oz. Fragrance free and vegan. For Paula's Choice, get their newsletter to take advantage of frequent sales. 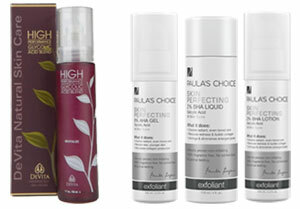 Paula's Choice has the widest selection of AHA/BHA products and has trial sizes available. Paula's Choice is also available locally at Pharmaca, but product selection varies by store so call ahead. Vitamin C has several forms: l-ascorbic acid, magnesium ascorbyl phosphate (MAP) or sodium ascorbyl phosphate, and tetrahexyldecyl ascorbate are the ones with the most documented research. If you don't respond to one form, try another. For example, some people who don't respond to MAP respond to l-ascorbic acid, and vice versa. L-ascorbic acid is generally the most effective form, but its low pH can be too harsh for sensitive skin. Always test this product on a patch of skin first. If it's too harsh, go with a magnesium ascorbyl phosphate or sodium ascorbyl phosphate form of vitamin C instead. Vitamin C degrades quickly in light, air, and heat. Do not buy a vitamin C product that is in clear packaging. Store your product where it won't be exposed to heat. The telltale sign is if it has turned orange. If so, it has degraded enough that you should not use it. Packaging in either an opaque container or a blue or amber container, and preferably a pump or tube to reduce exposure to air. DeVita C Serum 17% Topical (17% l-ascorbic acid plus magnesium ascorbyl phosphate), MSRP $35.95/1 oz, but at Vitacost for $24.56. Fragrance free and vegan. Paula's Choice Resist C15 Super Booster (15% l-ascorbic acid), MSRP $49/0.67 oz. Fragrance free and vegan. 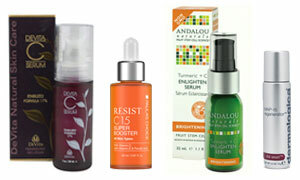 Andalou Turmeric+C Enlighten Serum (magnesium ascorbyl phosphate), MSRP $24.95/1.1 oz, but at Vitacost for $19.99. Vegan. Dermalogica MAP-15 Regenerator (10% magnesium ascorbyl phosphate), MSRP $87/0.3 oz. Fragrance free and probably vegan (Dermalogica educator believes so, but couldn't absolutely confirm). Retinol is potent, and you'll want to be careful when you start it. Be sure to follow label instructions. Usually, it's recommended to use at night, but again, read the label instructions for proper use of that particular product. As with AHA/BHA products, using an SPF 30 sunscreen is critical when using a retinol product. If you don't, you are exposing new, vulnerable skin to UV rays, and you can cause more harm than good. Formula that also contains a form of vitamin C, which helps retinol be effective. Packaged in an opaque container or amber or blue container. Retinol degrades quickly when exposed to light. A retinol product in clear packaging is probably ineffective by the time you buy it. Paula's Choice Clinical 1% Retinol Treatment, MSRP $56/1 oz. Includes vitamin C (tetrahexyldecyl ascorbate) and peptides to boost performance of retinol, plus hyaluronic acid and glycerin. Fragrance free and vegan. Dermalogica Overnight Retinol Repair (0.5% retinol), MSRP $85/1 oz. Includes vitamin C (sodium ascorbyl phosphate) and peptides to boost performance of retinol, plus glycerin. Many fragrance components from essential oils, so may not work for sensitive skin. Like retinol, peptides also have the ability to signal cells to behave better. Different peptides have different effects. Palmitoyl tripeptide-5 and palmitoyl oligopeptide may boost collagen production. Palmitoyl oligopeptide may also boost production of hyaluronic acid (the stuff between our skin cells that binds water and plumps our face). There are several other peptides, which generally may help aging cells function better. Peptides are usually added as supporting ingredients to products. Look for them in the ingredient list. Many of the products shown in this article include peptides. As an example, here's what I use. I have normal skin, but my T-zone tends to get clogged pores. Caution! Everyone's skin is different, so my routine may not be the best one for you. This example is just to show you how an anti-aging routine might look. If you have sensitive skin, for example, you may want a lower strength product or to use products less frequently. If you aren't sure or if your skin reacts badly, stop and ask the brand for advice. DeVita C Serum: To get all the benefits of vitamin C, but especially for its help against UV radiation. Kiss My Face - Face Factor SPF 30: My main line of defense against UV radiation, plus it's a good moisturizer with hyaluronic acid and glycerin, and it has good antioxidants, too. Then I apply my makeup. Paula's Choice 2% BHA Liquid Exfoliant: Slough off dead skin cells, to help skin tone and texture and also to make the next product, retinol, more effective. 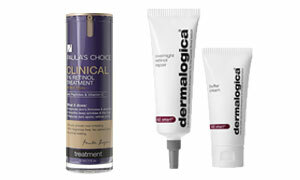 Paula's Choice Clinical 1% Retinol Treatment: My main line of attack on wrinkles and other aging effects. This product includes vitamin C to enhance the effectiveness of the retinol. It also has glycerin, hyaluronic acid, and peptides to round it out as an overall great product for me each night. Note: Using BHA (or AHA) and retinol together every night may be too much for some. Ask the brand for advice first. I need just light moisturizing, so these products provide enough for me. If your skin is a little dry, you may want to add an evening moisturizer to your routine. What Facial Care Brands Work for Me? Identify brands that meet your budget and lifestyle needs. What Stores Have My Brands? Locate online and local stores that stock your brands.